Wooden elephant shaped mobile art drying rack, ideal for use in schools, pre-schools and nurseries. 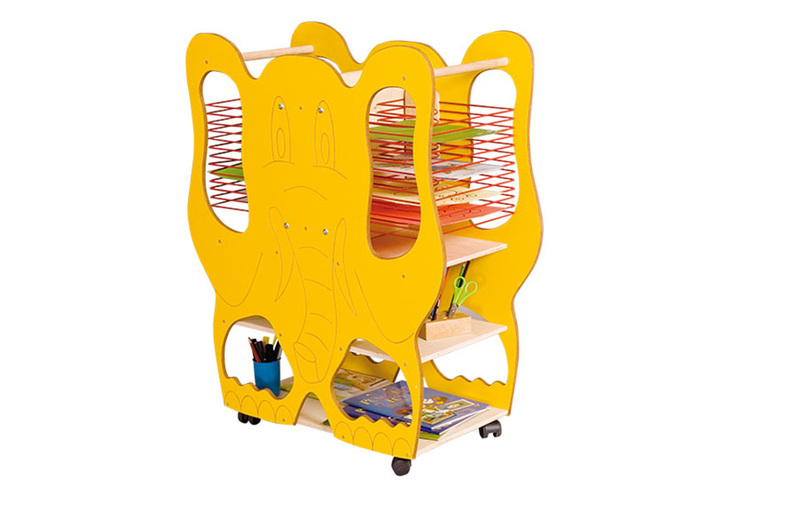 The unique elephant design adds character and organisation to any art corner or classroom. This classroom drying rack comes with 26 evenly spread drying racks suitable for art projects up to an A4 size. The steel shelves are plastic coated with a red finish to add to the colourful design. Shelves are all adjustable, interchangeable, and can be removed for easy cleaning. Simply reposition the shelves to fit different sized pieces of artwork. Increase or decrease the gap between shelves to accommodate artwork which may have a larger depth or height. Manufactured with enough room between drying shelves, this drying rack is designed so artwork doesn’t get damaged, mixed up or spoiled by other prints. Each shelf has a maximum load bearing weight of 2kg’s so can be used for artwork as well as classroom craft projects. This drying rack in classrooms allows you to dry multiple pieces of artwork at once without crowding tables, easels and windowsills. Assign pupils with individual racks to store their own artwork whilst it’s drying so work is organised and classroom mess is kept to a minimum. The fun, child-friendly elephant design is durable, hard-wearing and has easy clean surfaces. The unit is manufactured from birch plywood and finished with rounded melamine edges for increased safety. This unit boasts 3 wooden internal shelves below the drying rack. Accessible from both sides of the unit, these are perfect for storing art supplies or classroom stationary. At the bottom of the drying shelves, there is a wooden shelf which prevents excess paint from dripping on to the shelves below. Complete with 4 easy-glide locking castors which allow for easy movement between classrooms, and a handle rail on each side to help transport the unit. Generously spaced shelves also allow work to dry quicker because there is airflow to both the top and bottom of prints. Fully conforms to BS EN 71 parts 1, 2 and 3, making the unit safe for use by and around children. For more information on the Elephant Drying Rack, please contact us or call us on 01733 511 121. Dimensions: 960mm (h) x 770mm (w) x 510mm (d).